Planning a truly exceptional trip will firmly establish you as the vacation hero among your group. Chartering a pontoon with two decks and two water-powered slides will not only provide an exceptional experience, it also creates multiple options not found when chartering other types of boats. Family and friends who want to work on their tans or take a trip down the slide can enjoy the upper deck. Those who want to also take advantage of the breeze and the views, but steer clear of the sun, have plenty of shaded area on the lower deck. These double-decker pontoon boats can comfortably accommodate up to 12 of your closest friends and family. You won't need to split up your group, charter two boats, or find separate activities for different ages. It really is an experience your entire group will enjoy and remember. For those who count their pets as family members, there is more good news! For a small additional fee, it is possible to bring along dogs for the ride, letting them join in on the family fun. Pontoon boat charters let you take control of the party! Prepare for a great day on the water without searching for a place to eat by bringing along coolers and ice chests filled with your favorite drinks and food. This is a smart way to save on food and drink costs, especially when catering to an entire family. Providing your own sandwiches, snacks, and drinks is more cost-efficient than eating out. This will leave more room in the budget for other fun activities in Destin. Sometimes, the best part of spending the day on a pontoon boat is just relaxing, feeling the wind in your hair and admiring the beautiful waters of the Gulf of Mexico. However, there are also plenty of fantastic recreation opportunities available when you charter a pontoon boat. Bring along snorkels, masks, flippers—and plenty of sunscreen—and take advantage of the opportunity to check out the beautiful underwater world around you. 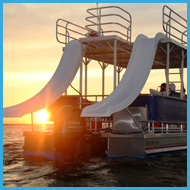 Chartering the unique double-decker pontoon boats with two built-in slides provides a unique recreational activity which passengers of all ages can enjoy. Do you like to fish? For an additional fee, you can bring along fishing poles and try your luck out right from the deck of the pontoon. Ok, it's not officially considered a ship, but opting to charter a pontoon boat allows you to take control over your family's itinerary on the water. You can choose where to cruise, when to stop, where to eat, and more. One of the great things about pontoon boats is that they are straightforward to operate. Many locals and those vacationing in Destin love the idea of chartering a boat during their vacation, but may shy away from it because they think a boat captain's license is always required. The truth is, as long as one adult meets the minimum age requirement, a license isn't needed. However, if you don't meet the age requirements, some pontoon charter companies provide a license test package on site or you can access the Florida Boater Education Course online. While there are some restrictions on where you can explore, you and your family will have no shortage of beautiful things to see and fun things to do. Feel free to head to Crab Island or anywhere within Destin Harbor and the Choctawhatchee Bay. For a day of unforgettable fun for the whole family, chartering a pontoon boat in Destin is the way to go. Let Double Fun Watersports hook you up with a beautiful double-decker pontoon boat during your Destin vacation. It will be a memory to last a lifetime.